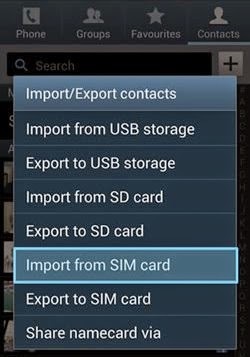 There are different options to import or export contacts from the Galaxy Note 4. You can import or export contacts from the phone's memory (USB storage), or from an optional memory card (SD card) installed on the device. Contacts might have been stored in the device memory or on a memory card if you are switching from an old device or if you received them from another device via Bluetooth transfer. Generally, contacts that you export are saved as namecards or files with .vcf extensions. The vcf files can be imported into other applications or devices that support the namecard format. This guide will help you learn how to import and export contacts from the Galaxy Note 4 device. You may refer to this whenever you think would be necessary. 3. Tap the More options icon (three vertical dots). Import from device storage - option to save contacts from the phone's memory. Import from SD card - option to save contacts from an optional installed memory card. 8. Select an account for the imported contacts or choose Device to import contacts to the device. 4. Select Settings to continue. Export to device storage - option to save contacts to the device's memory. Export to SD card - option to save the contacts to an optional memory card installed on the device. 8. To complete the export, tap OK.
That's how to import/export files from the Galaxy Note 4. Hope this helps.